The dangers of feline obesity include everything from diabetes to arthritis, but you can help your can acheive and maintain a healthy weight. Learn about why this is important and what you can do to get kitty's weight back in the healthy range. Do you live with a "Fat Cat"? My assistant and friend, Ruthie, recently mentioned seeing a very fat cat on Live with Regis & Kelly, and asked if I had ever done a column on feline obesity. Since I hadn't, I thought this might be a good topic to tackle this week. Ruthie, as you may know, lives on a farm in Southern Minnesota with several cats. She doesn't have the challenge some of you may because her cats get plenty of exercise running between indoors and outdoors. She mentioned that they spend most of their time outdoors in the summer months. The cat she saw is named "Powder", although her nickname is "Princess Chunk". Her owner was recently foreclosed on, due to the economy, and apparently let the cat go on the streets of Voorhees, New Jersey. The animal was found and taken to the local animal shelter. While I feel sorry for the owner, it seems to me that the cat took several years to get to its current weight of 44 pounds, which by the way is just two pounds shy of the Guinness Book of Records record of 46 pounds and 15 ounces. That cat lived in Australia and died in the 1980s. Unfortunately for our cats, the occurrence of feline obesity in the United States is climbing at an alarming rate. It is estimated that up to 40 percent of the cats in the United States today are considered obese. Obesity is defined as weighing 20 percent over a cat's ideal body weight, but many cats today are well beyond 20 percent. Does Your Cat Face the Dangers of Feline Obesity? How do you know if your cat is obese? You can tell if your cat is obese if you can't feel your cat's ribs, if there is no definition of its waist and if there is no tuck in the abdomen. An obese cat should be taken to the vet for a physical exam and have blood and urine tests run to make sure that there are no thyroid hormone issues or something wrong with his physical or metabolic functions. There are several dangers associated with obesity. diabetes is the leading concern and is being diagnosed in veterinary hospitals almost daily, but others include arthritis and a disorder called Hepatic Lipidosis. 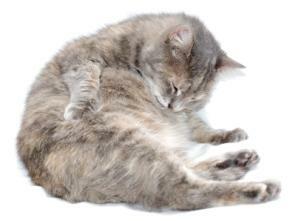 Obesity can cause pain and lead to death in your cat if left untreated. How did our cats get so overweight in the first place? One reason is the food we feed our cats today. The pet food companies make all these foods geared to attracting the owner, with shapes and colors and pretty bags that they think we will like. The problem with this is that we look at what is on the bag and not necessarily at the ingredients the bag contains. Cats were made to process protein, and many of the cat foods on the market today contain grains packed with carbohydrates. Cats are unable to digest carbohydrates because they don't have the enzyme amylase in their saliva that digests carbohydrates. Nature didn't intend for them to consume large amounts of carbohydrates. Due to this issue, a cat's body converts carbohydrates into fat, and it gets stored in their system. While it may gross you out, a mouse is a perfect form of protein for a cat if your cat were hunting for its own food. A mouse only contains about three to eight percent carbohydrates. Mice contain about twenty percent protein, nine percent fat and lots of water. One mouse would be a perfect meal for an average sized cat. If your cat does not have any of the aforementioned health issues to complicate matters, what can you do to help him take off the weight? First of all, put Fluffy on a diet; however, you have to reduce his weight gradually since an extreme diet can also be harmful to his health. A lot of pet owners use the "free choice" method of feeding their pets. For those of you who don't know, "free choice" means filling a dish with food and letting the pet eat at his leisure. Nature didn't intend for this either. Since animals in the wild are not "provided" with their food, they have to hunt it to sustain their bodies. They get exercise because they hunt their food. So here's "Fluffy", an inside cat that may not exercise and eats whenever he wants because he is fed "kitty junk food" (as Ruthie calls it), free choice. No wonder he is overweight. After Fluffy has been to the vet and found to be overweight, how do you fix the issue? Get a high protein cat food with a protein level between 35 and 45 percent (dry matter based). Make sure it doesn't have lots of grains (i.e. corn or wheat that create carbs). Make sure it has a reasonable fat level; your veterinarian can help you determine this. Feed several smaller meals per day, not free choice. Dump the cat treats in the garbage; they have lots of carbs also. Get a few cat toys. Get off the couch and play with Fluffy. This will give you both exercise and can help get that weight off Fluffy. Believe me, this will help Fluffy remain healthy, and help keep him with you for a longer, more satisfying life for both of you.